Valentines is on its way….the more sceptical amongst you may think its just another way the card and gift manufacturers get you to part with your hard earned cash, and in many ways I agree. However, I also feel that its a way of making you stop and truly appreciate the loved ones in your lives, and I don’t just mean your significant others. For many many years, before he was sadly taken from us, I would send my Great Uncle, or as we all knew him, Unc, a Valentines card. And I would always get one back. My Unc was better than any grandfather. He was a personality bigger than anyone I’ve known since. He was a salty old sea dog with tales from his time as a sailor and when he worked in Southampton Docks. He build stuff, he helped us move, he put up our shelves (at times slightly wonky, but we always forgave that because he put them up). He was generally the grandfather you read about in story books. After my Aunt died he moved in with my parents and became one of the most important members of our family. He was never a blood relative as he married into our family, but I would never consider him anything other than family. And it is at Valentines I remember him most because I miss his card, and the thought taken to send him one. He was always there for me and it was an opportunity for me to remember to tell him how much he meant to me. Also, he liked his food and he would try ANYTHING! Therefore, I am dedicating, these slightly unusual cupcakes to him. Now…….don’t instantly go YAK when I break the news to you of what makes these cupcakes pink. You’d happily eat carrot cake, so why not try Beetroot? Yep!!! Beetroot! And just think of the amazing colour! 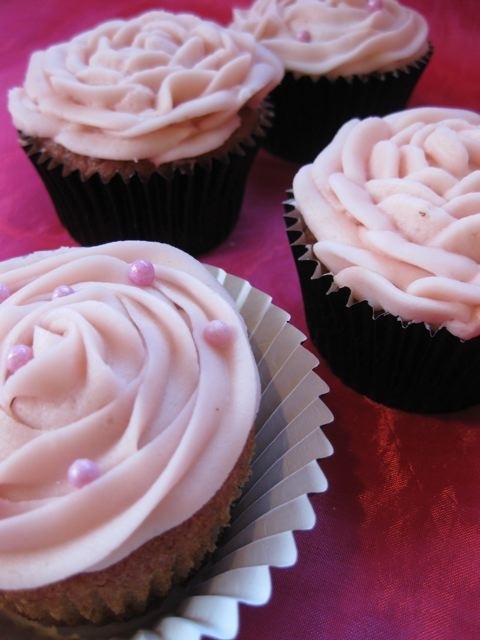 Pink cakes without any hint of artificial colouring. I tried these cakes, straight from the oven when still warm, and would recommend you don’t. These cakes are definitely next day cakes! The earthy Beetroot flavour subsides with time, three days in they were at their best! Beetroot and Vanilla Cupcakes The recipe is based on one from here adapted to make slightly fewer and with a different buttercream icing. 120gms Caster Sugar 120gms Unsalted Butter at room temperature 120gms Self Raising Flour sifted 2 eggs (separated) 120gms Cooked Beetroot (if using vacuum packed DO NOT use the one in vinegar) Puréed. (save some juice for the buttercream) 2tspn Good Vanilla Essence Pre-heat your oven to 160c, 140c fan or gas mark 3 Line a cupcake tin with 10 cupcake cases In a bowl cream the butter and sugar until light and fluffy Add the egg yolks, pureed Beetroot and Vanilla and mix Next mix in the Self Raising Flour until combined In a separate bowl, whisk the egg whites until you get stiff peaks Add one spoonful of the whisked egg whites to the other mixture and mix vigorously Add the remainder of the egg whites and carefully fold in until fully combined and no white streaks can be seen Stand in awe whilst looking at the colour of your cake batter! Spoon your mix into your cupcake cases Bake for 15 to 20 minutes, or until a cocktail stick comes out clean of mixture when stuck in the middle of one of the cakes. They may take slightly longer to bake depending on how much moisture your Beetroot has in it. Remove the cakes from the oven and leave to cool on a wire rack Just look at the colour of the cake before they are iced! Beetroot Coloured Buttercream 100gms Unsalted Butter at room temperature 400gms Icing sugar 3tspn Beetroot Juice saved from the Beetroot when making the cakes 2tbspn Milk Beat all the ingredients together until light and fluffy. If you want a stronger colour, just add more Beetroot juice. Beware however, the more you add, the more likely you are to be able to taste it! Just add a drop at a time, until you get exactly the colour you want. Pipe or smooth the buttercream with a knife onto your cakes and enjoy!